Powderhorn ski area is located in Western Colorado's Grand Mesa. While small in size, it still offers a host of fun for skiers and snowboarders of all ages and abilities. This area is not about steeps and deeps, but instead offers a mellow experience, free from the crowds of other Colorado ski areas like Vail, Breckenridge or Copper Mountain. Skiing began in on the Grand Mesa in the 1940s when a rope tow hauled enthusiasts up the mountain. By the 1950s Mesa Creek ski area opened with one surface lift. Then, in 1966 Powderhorn ski area opened, just two miles below the old Mesa Creek area, with a double chair lift and a surface lift. Throughout the 1970s and 1980s Powderhorn ski area added more chairlifts and terrain to the area. In 1986 the owners sold the ski area to a Texas developer who replaced the main double chair with a quad, and replaced the surface lift with a double chair. The developer added paved parking lots, and snowmaking capabilities. More improvements have been made over the last two decades, and the ski area has been sold twice. Prior to the millennium, 5000 square feet were added to the mountain's day lodge and the Inn at Wildewood and Wildewood Restaurant were opened. Most recently, the ski area has added two trails, three gladed runs and two new expert runs, which added several dozen acres of skiing to the mountain. 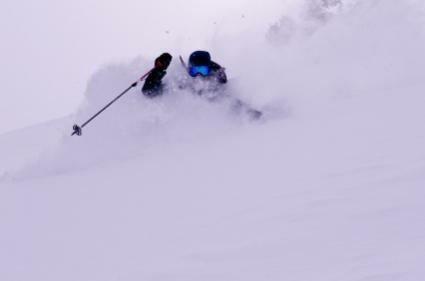 While the mountain has more beginner ski slopes than intermediate or advanced, it is still an excellent mountain with hundreds of acres and top notch snow. In addition, there are no big crowds to deal with and the ticket prices are wallet friendly. Powderhorn is an ideal place to learn how to ski or snowboard. They have an excellent ski and snowboard school that is designed to help first timers learn in a safe and not-overly intimidating environment. Learn to Ride series--a series of three sessions. Once completed you receive a season pass for the rest of the season. Freeriders--Eight full-day lessons that are designed for kids who want to learn how to ski and ride the whole mountain. Powdercats--Designed for children ages four through eight. Telemark Clinic--Participants learn how to Nordic downhill or improve their skills during one-day clinics. There are three lodging options at Powderhorn ski srea. Only one is slopeside, but the others are close by so you can be on the slopes when the area opens for first tracks. A beautiful inn situated at the base of Powderhorn, this mountain getaway is affordable and offers great amenities. They boast a spacious sundeck, dry sauna, and a lounge area with a big screen TV. Every room comes with a television, refrigerator and coffee maker. Winter lodging prices start as low as $119, and includes two half-price lift tickets. A beautiful little house just a few miles down the road from Powderhorn, Hilltop House is a great retreat for small groups or families. It sleeps eight people, has a full kitchen, a large dining room, hot tub, satellite television and a large deck. The Goldenwood Condominiums are just a short way from the ski area. You can choose from one, two or three bedroom condos that are fully furnished and come complete with kitchen and satellite television. There is also access to the facility's hot tub and sauna. If you like what you see and want to return again and again, there is a vacation ownership option available.